The VECTOR² ANPR camera captures license plates reliably in all weather conditions and even at night. The VECTOR2 ANPR (automatic number plate recognition) is a traffic monitoring camera that automatically captures license plates. It enables reading license plates reliably over two lanes even in poor weather and lighting conditions. The state-of-the-art VECTOR2 technology is contained within a single compact unit consisting of two high-resolution camera modules and an IR flash. This enables license plates to be recognized even on dark unlit roads. The license plate recognition can be configured to read license plates in many different countries and provides accurate license plate identification even at high vehicle speed. The scene and license plate images from the VECTOR2 ANPR camera can be transferred in real time via a cable or wireless to a local database. This ensures fast, constant access to the data which is encrypted in accordance with the latest DES and AES standards. 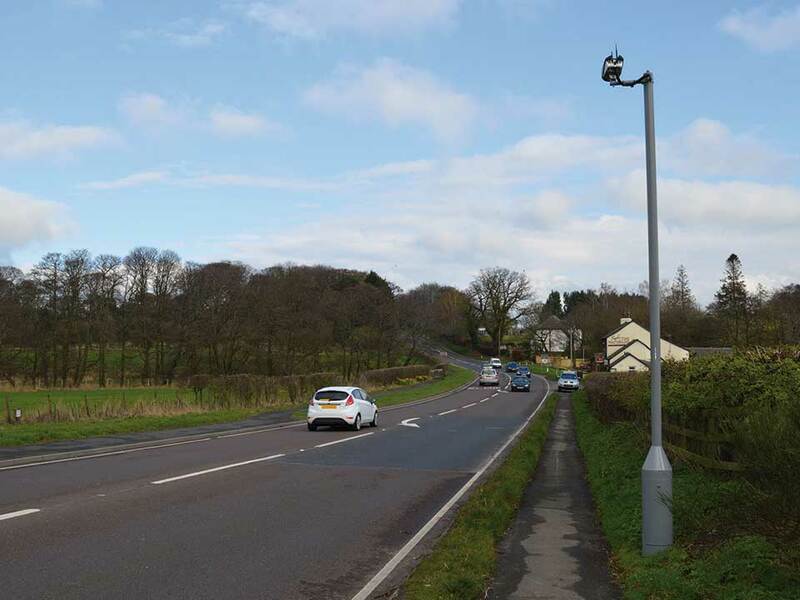 The traffic monitoring camera is fitted with many additional features, such as GPS clock, inbuilt compass and accelerometer sensors and two light sensors. This technology means that the VECTOR2’s performance can be optimized for a wide range of demanding applications and can be dynamically adapted to changing conditions. The VECTOR2 ANPR is safe and secure and can provide real time alerts if moved or tampered with. Simple installation options — even on existing infrastructure: The versatile VECTOR2 ANPR camera can be installed on an existing infrastructure such as traffic lights, street lamp poles or signal bridges. The VECTOR2 ANPR camera is fitted with various mounting options as standard. This makes it easy to install and ready for operation in a very short time. The power supply and data transfer are provided via a single cable; no additional housing is required on the road. User-friendly configuration: The camera is configured easily by remote access via a user-friendly graphical user interface (GUI). The installation manual shows the most important steps so that the camera can be put into operation. There is no need to program complex routines. Automatic operation — simple to use: As soon as the camera is switched on and recording data, it automatically starts to monitor its own performance and the surroundings. A sensor detects the lighting conditions and automatically adapts the image quality. The VECTOR2 automatically switches to night mode when lighting levels fall below a specified threshold. The camera is optimized for poor lighting conditions and captures clear black and white images. Motion sensors detect excessive camera movements and trigger an alarm. This enables intervention at an early stage in the event of vandalism, for example. A warning message is also received when the quality of the license plate reader drops below a specified threshold value. This value can be configured alone. Thanks to remote connection and access via WLAN, 3G or ADSL, the cameras can be controlled at all times. No physical access is required. Alternative trigger modes can be selected: The VECTOR2 ANPR can be operated in two trigger modes. The camera automatically detects every car that passes the field of vision. Alternatively, only certain vehicles are captured by the triggering of an external sensor. Thereby, up to two lanes in the same direction or in opposite directions are covered. Day and night mode: Images can even be captured on completely dark roads. Secure: Encrypted data is stored on local high capacity servers and is available at all times. Flexible: License plates from a large number of countries are read reliably. Stands up in court: Images and data that are captured such as license plates, reading confidence, time, date and camera location, can be presented as evidence before a court. Robust: The camera works in adverse weather conditions. User-friendly: The VECTOR2 ANPR is simple to install, configure and operate. Traffic monitoring: Matching with police watch lists, speed enforcement. Civil sector: Tolling, measuring journey time , access control, congestion charging, security cordons, parking management.